Today, Jamaica celebrates her 51st year of Independence. There have been many changes in the country since 1962, notably in the way we eat. Take rice and peas, for example. (Rice and peas is affectionately referred to as the Jamaica Coat of Arms, though I haven’t been able to find out why.) When I was growing up in rural Jamaica, we had rice and peas only on Sundays and on special occasions, like Christmas or Easter. Now, there’s rice and peas on almost every restaurant menu every day of the week. The Easter bun and cheese that we had only at Easter is just as commonplace. Back then the patty, a meat-filled turnover, was our main fast food and a popular lunch item for school children. With international chains like KFC, Burger King and Domino’s, along with the homegrown chains, Island Grill, Tastee, and Juici Patties in almost all fourteen parishes, we have a variety of fast food restaurants to choose from now. Sundays still are special. For most of us, it’s the day we pause, bring family around the dining table to share the meal. But it’s not always rice and peas. I’m no longer wedded to the Jamaican Coat of Arms on Sundays because I don’t want to spend a lot of time in the kitchen. But I wouldn’t plan a Christmas or Easter dinner without it on the menu. How has your eating habits changed in the last twenty years? Wash and soak peas overnight or put to boil in a medium saucepan with enough cold water to cover. Add garlic and a little salt to taste. When peas are soft, add coconut milk and seasonings – thyme, Scotch bonnet, 2 sprigs of scallions, black pepper, and remaining salt, if needed. Let cook for a few minutes then add the rice. Cover and cook until the rice is tender and there’s no more liquid. Plate and garnish with remaining scallion. Serve with your choice of meat or alone. Yummy, I didn’t know you add coconut milk, but I love rice and peas! My eating habits have changed the last few years in that I do my best to eat clean and stay away from processed foods; or I at least do my best to eat 80% clean and 20% processed. It has changed my life! Thanks for the recipe. I might try this one day! 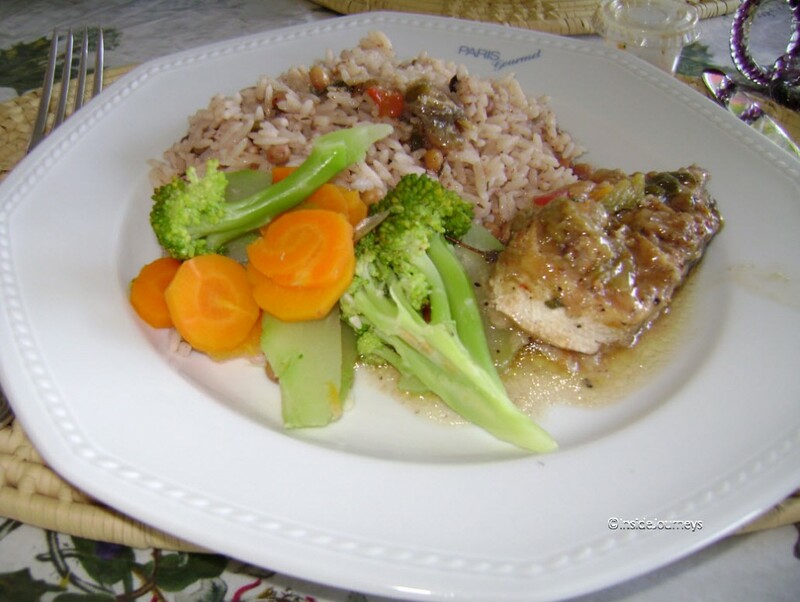 I\’m surprised that rice and peas (beans) was considered a special holiday meal in Jamaica. In Mexico and Central American countries it seems to be a staple meal. Is there a particular reason this was the case? What a yummy post my friend! Sounds like a scrumptious recipe and would love to sample your authentic cuisine someday soon!! Hi Marcia, As usual that dish has my mouth watering! Thanks for the recipe as I just might give it a try! The link I added today is from our Greek travels a couple years ago and I am happy to report that this spring we went back to the taverna which is still owned by the same family, had the same — if not warmer — greeting than our first visit and the same quality food! That’s what I’m talkin’ ’bout. Some rice and peas. Heck, any Jamaican food really. You know, I was sitting here talking to my daughter and told her we should go to Jamaica for spring break. Well, she doesn’t wanna hang out with me, so I was thinking to come by myself in February. I’ll let you know. I need to check my coins and whatnot. I didn’t know that rice and peas was only eaten on Sundays. You’re right that it’s now an everyday staple. It’s definitely one of my faves! Looks yummy. Also very English. Funny how our eating habits change over time as well as what’s considered special vs. everyday. The rice and peas dish look great — I can see why it once only a special occasion kind of thing. Happy (belated) independence day, Jamaica! I have several friends from Jamaica. Living here in south Florida I get to experience some of the culture and food but everyone says its nothing like back home. Thanks for the recipe I am sure the wifey will be trying this one. Have to leave out that pepper though I am not a spice person. The biggest change for me in the past 20 years is going from having my mom cook to cooking my own food and now sharing those duties and eating more at home with the family. The taste is definitely different back home, Thomas. Hope you get to visit one of these days and try it yourself. I also hope your wife tries it, without the pepper. Enjoy! You can leave out the milk and also use brown rice, Robyn. It adds a few minutes to the cooking time but it doesn’t take away from the taste. I’m happy that you’ve reduced your processed food consumption — it’s something we should all try. I guess as we change, our eating habits change too. Seems obvious, right? Thanks for the Independence wishes, Cathy. I’d say we’re all getting more responsible. We have more information now, so we’re making better choices. Thanks for returning the visit, Dawn! Yes, always a Sunday meal. One of my faves too. Thanks, Mike. Hope you get to try it. Also, I’m glad you met so many terrific people – that’s part of what this blogging thing’s about, right? Okay, Totsy, check your coins and let me know. Would be great to show you around. but it must have happened. It’s the cycle of life. Anyway, just come hang out with me. I love stories like that, Jackie! It’s what makes travel so rewarding – making friends and staying connected. Hope you get to one of these days, Jeff! Actually, except for broad beans or butter beans, I think we call them all peas. It’s very filling and can be eaten without meat. I’m not sure, Suzanne and I’ve asked a few of the older folks but they don’t seem to know. I suspect it might have something to do with slavery and what people were allowed to/could afford to eat back then. I also suspect eating rice was a luxury as we didn’t begin growing it until after slavery.